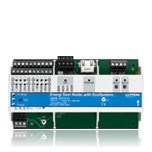 Lutron offers systems similar to the Energi TriPak for applications that require multi-area control or enhanced automation and integration features. Each provides energy-savings, wireless capability and reliability and are designed for a variety commercial applications. Browse through the similar systems below. Energi Savr Node for Switching can switch up to four 16 A loads, such as third-party switching ballasts, motors, and other non-dim lighting loads. 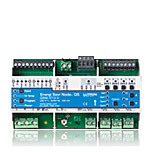 Energi Savr Node for 0-10 V provides switching and dimming control for up to four 16 A circuits of 0-10 V loads. This module allows the integration of third-party 0-10 V fluorescent ballasts and LED drivers into a Lutron lighting control solution. Energi Savr Node with EcoSystem can control up to 128 EcoSystem digitally addressable fluorescent ballasts or LED drivers. Lutron exclusive EcoSystem technology is used in intelligent fluorescent and LED lighting control solutions to create flexibility in a space. Fully customizable, GRAFIK Eye QS adjusts lights and shades for any task or activity at a touch of a button. The GRAFIK Eye QS main unit is available in two control models: Phase Control and DALI. The Phase Control model accommodates up to 8 zones and provides control of incandescent/halogen, magnetic low-voltage, and non-dimmed lighting loads. The EcoSystem offers up to 16 zones and can connect directly to DALI digital fluorescent ballasts and LED drivers.